Sometimes a bottle on the shelf just strikes me as being something a bit different and hence the reason I picked this one up. The bottle itself had an informative mini-greeting card attached to it's neck and a flashy ribbon sticker that went over the top of the cap. 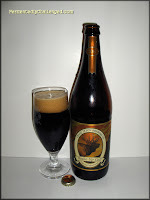 This brew was named Grand Teton Brewing Company Wake Up Call Imperial Coffee Imperial Porter. It's part of their 2011 Cellar Reserve series. This brewer from Victor, Idaho is no stranger to Colorado as I've seen bottles from this brewery on shelves here for several years. Wake Up Call is the type of brew that (supposedly) can be enjoyed anytime of day, even breakfast, due to the addition of coffee. It's a fairly bold brew, weighing in at 7.5% ABV, so perhaps it's not the best thing to have just before the morning commute. The beer also has an IBU rating of about 40 so you'll know it's decently bitter as well. Wake Up Call comes in a large 750ml bottle, yet without a cork or cage. I shouldn't forget that this is also an imperial porter, so I can expect to get a bit of roast, some cocoa and caramel tones and a good kick from the higher ABV. Would this coffee porter measure up to others I've had recently, let's find out. 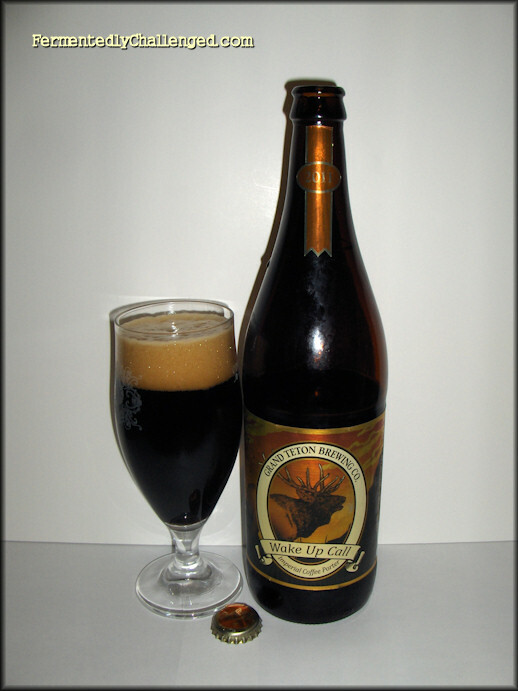 Appearance: Wake Up Call, a bottle conditioned brew, opened with a nice hiss and poured a very, very dark brown. A decent sized tan brown head rose in the glass and left a sticky lacing alongside the tall narrow glass. The lacing stuck around for a while. The brew seemed adequately carbonated for a porter. I could see just a hint of a dark mahogany edges around the glass. Dark, foamy and with a nice head. So far so good. Aroma: When this brew was cold, right out of the bottle, the dominant factor in this brew was the roasted coffee. As the beer warmed, I could pick out some chocolate and lastly some tell-tail earthy hops. It seemed to be a nice blend of scents. Some nuttiness, roasted malt, a touch of hops and of course an acidic rich coffee aroma. It was inviting. Taste: The first thing I tasted with Wake Up Call was the sweet roasted malts. There was definitely a coffee sensation there, bitter, slightly acidic, but with some caramel maltiness, a full body and with some highlights of cocoa. It was just sweet enough to balance the bitterness. Almost like what a good creamer does with coffee. It's almost hard to tell the difference between an imperial porter and an imperial stout anymore. I suppose this porter was a tad sweeter and had a bit more caramel malts in it to keep it from being a complete roast-fest. It had a nice balanced taste just just enough hop in there to notice. Overall: I had no problem what so ever in finishing off the entire 750ml bottle myself over the course of a 3 hour period. I slow sipped it while watching some of my favorite TV episodes. I quickly became a fan of this imperial coffee porter. While I'm not going to start drinking coffee (never got used to it in the morning), I'm certainly won't stop looking for good coffee porters and stouts. Grand Teton Brewing Company is definitely on my to-buy list. I've liked this brew and also their ESB that I tried a couple years back. I look forward to sampling more brews from this Idaho brewery. Have you tried a Grand Teton Wake Up Call Imperial Coffee Porter? What did you think of it?